Today, I went with friends to the Shenandoah Valley Fiber Festival outside of Berryville, Virginia. I’m not much of a fiber person. I don’t knit or spin or weave and I can only just crochet and don’t enjoy it very much, but I do like a day out with friends, and I like all the animals. They had border collies demonstrating their considerable skills with sheep, which is always fun to watch. There were also various types of sheep and goats along with a smattering of llamas, alpaca, and one camel, who was very funny. 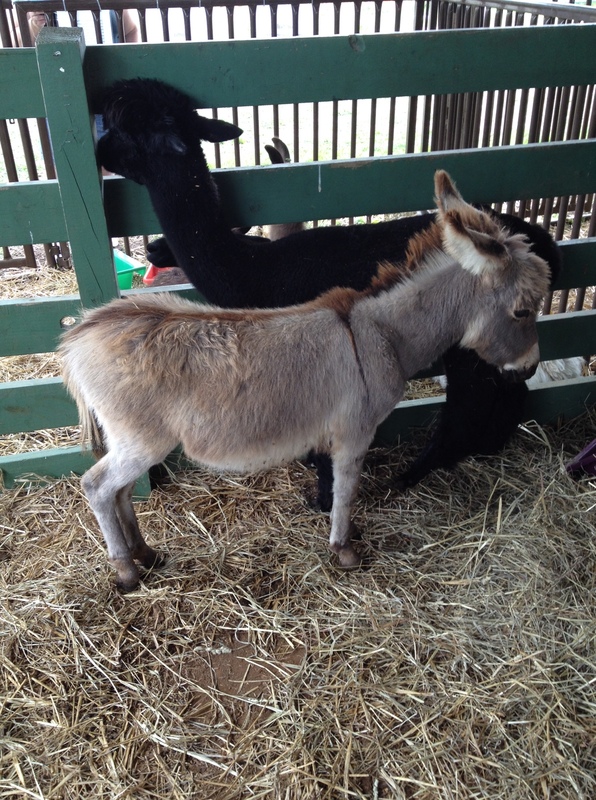 There was also an emu and some angora rabbits, but my favorite animal was the little guy below. He was for sale and I thought he would have made a nice addition to my sister’s menagerie, but sadly (or perhaps luckily for her) he had already been purchased. Goodreads Giveaway for One Big Beautiful Thing. I’m running another giveaway on Goodreads. Check it out! On September 5th-8th, I attended and volunteered at the Writers’ Police Academy. This is an event like no other for writers. There are no writing workshops, no agents, and no publishers. Instead, it’s a weekend of hands-on workshops about all things cops and robbers. We get to do things like fingerprinting, evidence collection (even underwater! ), room searches, firearms simulation training, and handcuffing. There are lectures by medical examiners, microbiologists, sociologists, police detectives, sheriffs, and paramedics. For most writers, it’s not easy to get access to police and fire personnel or to find out what a police car or an ambulance really looks and feels like inside. There are wonderful opportunities to improve the realism of our writing and to talk to professionals in the field. The special guest speaker this year was Kathy Reichs, who was both informative and hilarious. The keynote speaker was Lisa Gardner who gave an interesting and moving speech on the ups and downs of her writing career. As with the last WPA I attended, I couldn’t fit in everything I wanted to do. In case you think this was because I was volunteering so much, alas, that’s not it. I really didn’t do that much work. I watched over the free coffee and donuts for a little while and was supposed to sell coffee cups. I didn’t sell any, but in my defense, it was the last day and anyone who wanted one had already bought it. Later that night, I announced the winners of the silent auction and the raffle baskets, which didn’t really count as work, because I had such a good time doing it. I know that the Writers’ Police Academy is a tremendous amount of work, especially for Lee Lofland, as well as Nancy Metzner, Jo Williamson, and Megan Bowers of the High Point Public Library, and the entire public safety staff of Guilford Technical Community College. So many people are involved in making this happen, I couldn’t name them all, but I really appreciate the opportunity for learning that they’ve created for all of us writers. It’s also so much fun to see friends I don’t normally get to see like April Henry, who I met at the first WPA, who comes every year. 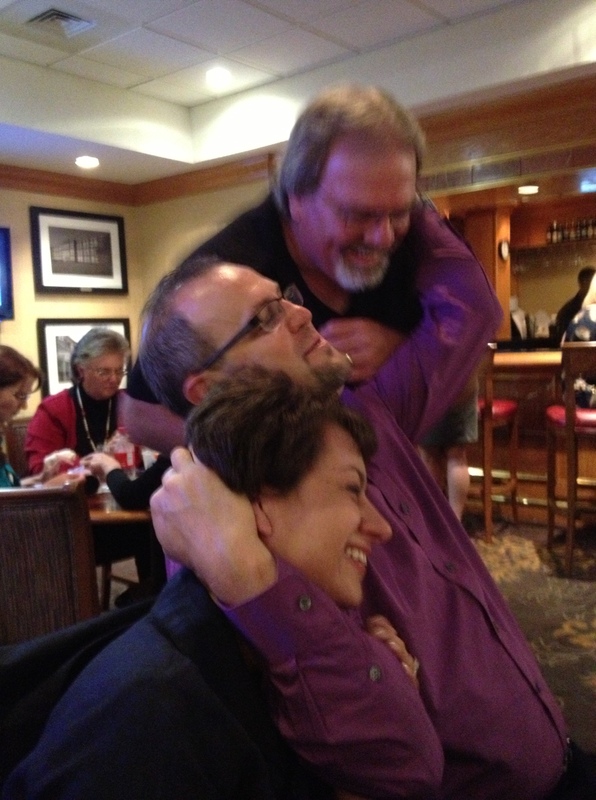 It’s also a wonderful opportunity to meet new friends like Marco Conelli and his fabulous wife, Mary Grace, pictured below enjoying the after-party in the hotel bar with Lee Lofland. Marco is a YA author as well as a former undercover police detective. He gives a great presentation that I was lucky enough to attend this year. This a great event and I really hope there is a Writers’ Police Academy 2014 in the works. For almost a decade now, I’ve been going to the Outer Banks of North Carolina with friends. Every year we stop what we’re doing and take a week to enjoy the sun and the beach, hang out at the pool, and catch up with each other. Most of us don’t live anywhere near each other and this is our only opportunity to talk in person. Activity on Twitter noticeably dips when we’re all at the beach, although we still tweet, and text each other and post things to Facebook, because despite our proximity, we are digital people. Every year we rent a big house, and although the occupants have varied over the years, the core group has remained the same. I’m always amazed that such a diverse group gets along as well we do. It’s a low drama crowd, and while none of us qualify as pollyanna, we do get along remarkably well. This year, for the first time, the house was only occupied by women. It was a different dynamic but a good one. 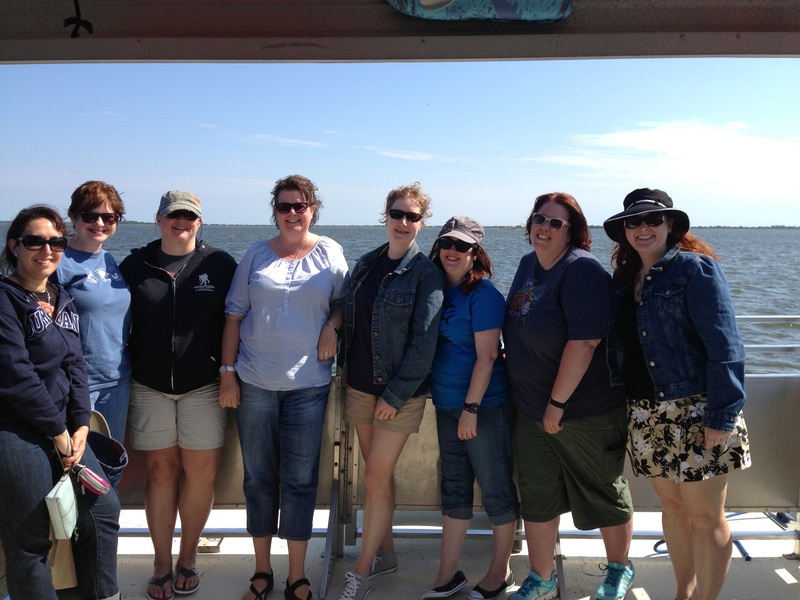 My sister, in a way that only she can, herded us all together on the dolphin tour for a group photo. I’m so glad she did. I love these women.